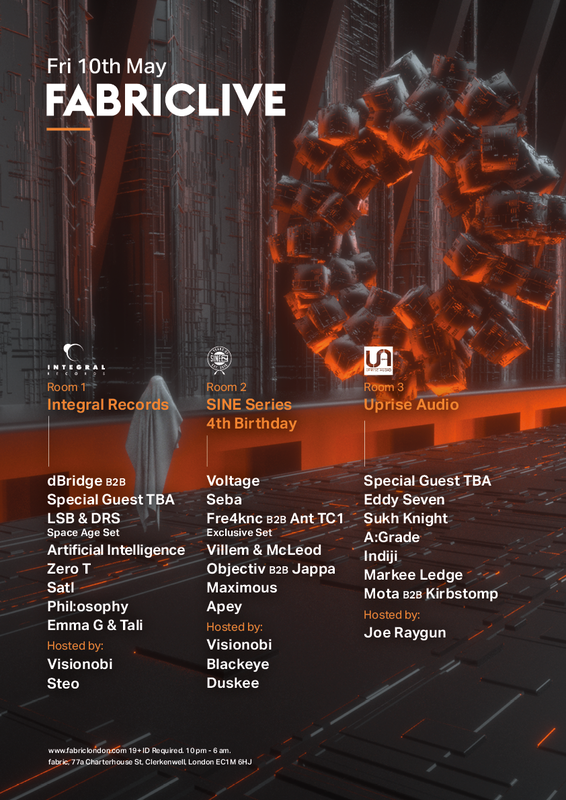 FABRICLIVE welcomes three linchpins of the UK’s drum & bass and dubstep scene as Integral Records, SINE Series and Uprise Audio take over. In Room One, Integral dive in at the deep end with a cast of the genre’s key players. Leading the proceedings is one of the greatest visionaries in drum & bass history, dBridge. The Exit Records founder brings his experimentalist approach to 170BPM music to Room One for a back-to-back with a special guest – keep a lookout for more info on this dropping soon. They’re flanked by DRS, who links up with LSB for a special Space Age set. Artificial Intelligence serve up their signature style of liquid funk, while Zero T showcases his metallic sound. Integral staples Satl, Phil:osophy Emma G & Tali stop by to round things off, with Visionobi and Steo on hosting. In Room Two, SINE Series celebrate their 4th birthday with a host of their closest affiliates. Voltage makes a return to the space, presenting the raw floor-driven sound that’s made him a Low Down Deep mainstay. We’re also honoured to host a rare appearance from a master of truly deep drum & bass, Seba. As the founder of the peerless Secret Operations imprint, the Swedish producer is best known for producing and releasing highly emotive, atmospheric D&B records. He makes his first appearance with us since 2013. The brains behind the unstoppable Dispatch imprint, Ant TC1 also returns to play on our Pioneer Pro Audio rig. He lines up for an exclusive set with Fre4knc, whose flair for techy D&B can be found through his work on Dispatch. Rounding things off are Spearhead favourites VIllem & McLeod, plus Objectiv & Jappa, Apey and Maximous, with Visionobi and Blackeye taking on mic duties. We hand the Room Three reins over to Uprise Audio, who have made waves as one of the UK’s most exciting young imprints around today for dubstep and its offshoot sounds. For their first session with us, label founder Eddy Seven lands alongside a special guest, plus one of the sound’s most vital names: Sukh Knight. A:Grade, Indiji, Markee Ledge, Mota and Kirbstomp all also rep, while Joe Raygun brings his deft lyricism as the room’s MC.